Looking back throughout history, we can clearly see that societies developed a wide variety of architectural styles when it came to their housing. And this makes complete sense, given the fact that they had to deal with different construction materials, environments, climates, threats, and situations, depending on where they were. Today’s houses all around the world work, more or less, on the same principle. But given the fact that we’re now more connected than ever, our houses start to look somewhat similar to one another – not that similar, mind you, but similar nonetheless. And like the architects of old (who’ve, in some cases, used state of the art technology to build their projects), so too do the architects of today go high tech to build tomorrow’s homes. Here are some examples where different techniques, both old and new, are blended together to create our future dwellings. Given what we’ve experienced this year, a hurricane-proof home sounds like an incredibly good idea. Sometimes described as livable yachts, these houses rest right on the water surface. Four 40-foot-long hydraulic legs attached to the sea floor constantly stabilize the structure, and can even raise it, if needed. Thanks to these pillars, the entire house is incredibly sturdy and can withstand strong winds, storms, and even hurricanes. And that’s not all these houses can do. They’re designed in such a way so as to be completely self-sufficient and 100% off the grid. They feature an integrated waste management system, rainwater harvesting mechanisms, and fresh water purification systems. In fact, the rainwater is collected, purified, and then used inside the home as completely safe, drinkable water. Furthermore, these 4,350-square-foot houses also come equipped with solar panels, batteries and high-end insulation. The windows are all made out of shock-resistant glass, meaning that debris can’t get through if blown by strong winds. There’s also a retractable 24×12 foot terrace that adds to the overall space, and the high-tech communications system keeps you in constant contact with the outside world. Oh, and did we mention that these livable yachts can also float? In fact, they can detach from their legs and move around at speeds of up to 7 knots, thanks to two 136 horsepower electric thrusters. So, if you get bored of your surroundings, or if a hurricane is headed your way, just turn on the engines and go. Bamboo is an incredibly strong building material, if you know how to use it. In fact, bamboo is still used as scaffolding in places like Hong Kong – being two to three times stronger than a steel beam of the same weight. And let’s not forget that bamboo was widely used as a construction material throughout the centuries in countries where it’s commonly found in nature. In more recent decades, however, it was replaced by concrete. Nevertheless, bamboo might just make a comeback in the near future. A Chinese architecture team entered a design competition in 2016 and won second place with their idea of building houses completely out of bamboo. Known as Rising Canes, their project won’t even use any nails or screws to get the job done. Instead, bamboo canes will be jointed together and tied with rope. What’s more, their bamboo house design is modular, meaning that it can be expanded upon in different shapes and sizes to fit every individual need. They envision their project to be in perfect harmony with nature. They see their Rising Canes houses being built close to bamboo forests that can provide all the construction material needed. Bamboo can be harvested every 4 to 6 years, reaching more than 130 feet in height during this time. It can easily replenish itself, and absorbs 35% more CO2 from the air than a regular forest of the same size. It also prevents land erosion. And to keep any such bamboo forest from disappearing, they suggest that for every cane harvested, two more should be planted in return. If we think about it, nothing is more representative of the world that we live in today than the shipping container. And this particular 2,150-square-foot house is made of a dozen, coming fully equipped with a kitchen, living room, and three bedrooms. It’s also in the middle of the desert. Now, anyone who’s ever been to the desert can attest, living in a shipping container in that scorching environment is something that more closely resembles torture than anything else. But thanks to their orientation at different angles, however, these shipping containers make the entire house look like some sort of blooming white flower, or like something that’s not really from this world. Located in California, the Joshua Tree Residence will be built on a 90-acre plot of land and will be the home of a movie producer who decided to remain anonymous. Construction is set to begin in 2018, and once finished the shipping container house will come fully equipped with solar panels, and a variety of other high-tech features. The differently-orientated containers will allow natural light to filter in throughout the entire day, but without actually making the inside seem like an oven. RISE – which stands for Residential, Inviting, Stackable, and Efficient – is a house project designed for urban infill lots. This means that this design is highly adaptable and malleable, given the limited space it has at its disposal. It has customizable floor plans and movable walls, installed on a track system that can roll to the sides, allowing for different rooms to be assembled or rearranged. 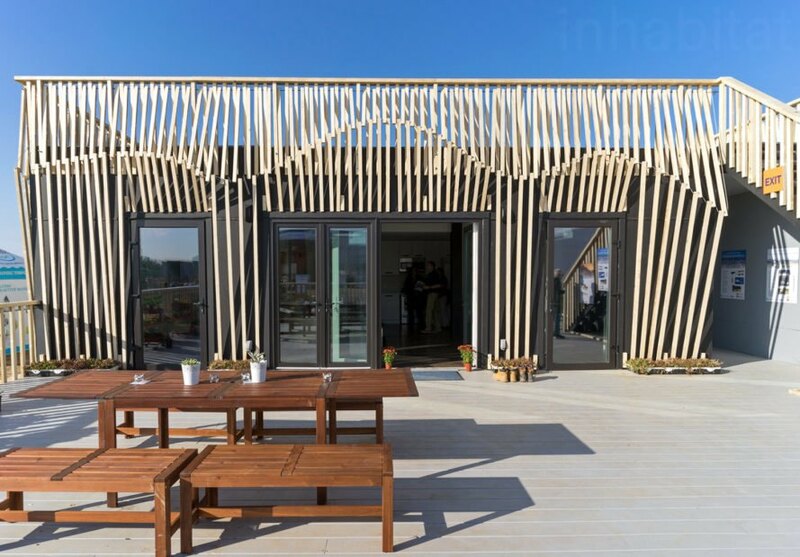 These homes come in modular and prefabricated pieces that can be scalable and stackable, turning a single-story family unit into a multi-story apartment building. What’s equally important about these houses is that they don’t require any specialized labor force to put them together. They also come fully equipped with technology designed to achieve net-zero energy consumption. These homes are solar-powered and make use of natural daylight and ventilation, while the walls are all lined with wool, with its northern façade being covered in moss for extra insulation. The University of California-Berkeley and University of Denver worked together on this project, as a means to address the shortage of affordable housing. “At $200,000, a single RISE unit is less expensive than 72% of homes in the city,” said the students in charge of the design. They also went on to say that its affordability is further increased based on the fact that up to five of these RISE houses can be stacked, one on top of the other, over a plot of land that would have been used traditionally by just a single home. Now, even though this project was designed for Richmond, California, it could easily translate to other cities that lack enough affordable housing. This 753-square-foot house is the perfect blend of minimalism, off-grid living, and camping, all in one. Shaped in the form of a tent, this house makes use of all the space it has at its disposal. 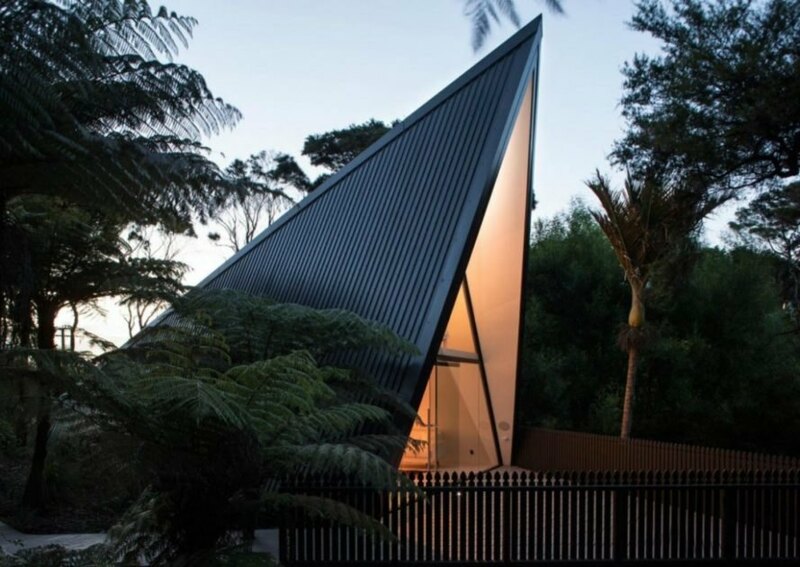 Located deep inside a New Zealand forest, the Tent House’s slick design blends seamlessly with its surroundings. Its façade is completely made out of glass, and the sleeping quarters are located at the mezzanine. This glass face also allows for the entire building to be flooded with natural light during the day, and offers a perfect view of the forest at night. Its front deck also extends out, right into the forest itself. Designed by architect Chris Tate, the Tent House originally served as his personal studio. But after several interior tweaks, and its relocation in New Zealand’s remote Waiheke Island, this A-frame house became a perfect retreat for those who wanted to get away from the hustle and bustle of the city. It’s currently available for short-term rentals. Usually, houses on stilts are reserved for tropical regions, or places with a high chance of flooding. But an architecture studio borrowed this technology and applied it to a winter and snowy landscape. Located in Quebec, Canada, the High House is elevated several feet off the ground so as to capture as much sunlight as possible during the winter months, and to give a better and uninterrupted view of Mont Saint Anne, seen in the distance. The clean, sharp, and minimalistic architecture is achieved with the use of corrugated steel roof panels and white concrete panel cladding. During a typical winter day, the house blends perfectly with its white surroundings, while in summer, it stands out against the green hills it’s perched on. The underside of the building makes use of a heating stove, keeping the temperatures bearable even during the harshest winters Canada can experience. Known as Green Magic Homes these buildings look more like hobbit houses than anything else. Though, not technically holes dug in the ground, these structures are covered with soil, giving the impression that they actually are. These ‘hobbit houses’ are, in fact, prefabricated vaulted panels that can be rearranged and expanded to fill every individual need. They are easily assembled, needing maybe just some sort of IKEA-style manual and three people to get the job done. Adding further modules can be done at any time. Because of their versatility, these homes can be adapted to fit almost any type of topography, blending perfectly with the surrounding landscape. The soil that will be placed on the entire surface of these panels will act as a perfect insulator, both during the scorching summer, or a frigid winter. This particular style of architecture draws inspiration from other earth construction and stabilization technologies such as superadobe and geotextiles. Inspired by how barnacles cling to ship hulls, the Cliff House in Australia is a design for a modular house suspended on the edge of a vertical cliff. It would also make a killer lair for a Bond villain. By making use of steel pins drilled directly into the cliff face, the different modules are stacked on top of each other. The design is meant to be seen as a sort of natural extension of the cliff itself, and not actually an artificial addition to it. The entry is made from the top level, which is a carport. A lift then connects the user with every other level of the house. The first level is made out of the foyer, kitchen, living, and dining spaces. The following two levels are made out of the three bedrooms and two bathrooms. At the very bottom, we have the terrace, barbeque area, and spa. The entire house is covered in solar-reflecting glass panels, giving an incredible view onto the ocean. The interior is presented in a minimalistic design, keeping the ocean view and the unique location as the focal point of the Cliff House. Created by MINI Living design firm, the Urban Cabin is a 160-square-foot modular unit, built to explore the potential of compact but comfortable living spaces in cities that become increasingly crowded and expensive. This design is set to represent a future where life will be based more on shared resources rather than personal property. “It’s about thinking through the possibilities of what it might mean to live in the near future – how we might begin to merge the public and the private, and how forms of domesticity might begin to evolve into forms that you don’t quite recognize,” said one of the architects. This tiny house comes equipped with everything one would need, including a kitchen and even a tiny library. The kitchen is also extendable, meaning that it can grow, even beyond the walls of the house itself. What the designers hope to achieve with this Urban Cabin concept is to create a series of these tiny homes in many other cities around the world – each with a personal touch, depending on the architecture and cultural characteristics of that particular society in mind. This one, for instance, is based in London, and the mini library and kitchen are something the lead architect believed best expressed the city in the most compact way possible. After attending Burning Man for over 20 years, Christian Weber decided that there must be a better and easier way than the fragile and hard-to-build hexagonal yurts people had to deal with. He then began working on a shelter that would provide enough warmth and protection from the elements, all the while being extremely easy to put together. He then came up with the Shiftpod, which has insulated walls, and is tall enough for most people to stand upright inside. It’s also incredibly sturdy, being able to withstand winds of up to 109 MPH, and comes in a single, foldable piece that’s assembled in its final position in just little over a minute. He began making a few for some of his friends also attending Burning Man, and soon enough ended up with over 300 orders. He has since launched his own company, and is now earning millions of dollars from his Shiftpods. He’s also donating one for every 20 sold. His is also working with several NGOs and other organizations at bringing his easy-to-use shelters to people and places where conventional housing is no longer possible. “There’s 53.4 million forcibly displaced in the world right now because of wars and politics,” he said. “A lot of them are living in shanty shacks with blue tarps, so we’re trying to create a low-cost, easy-to-ship, easy-to-set-up unit that people can live in for up to five years.” His Shiftpods have since Haiti, Japan, Nepal, Greece, as well as other regions where displaced people are in desperate need of shelter.